When it comes to guidebooks for the Hawaiian Islands, I always recommend the blue books—the Revealed series including Maui Revealed, Hawaii the Big Island Revealed, Oahu Revealed and Kauai Revealed. The Maui Revealed book includes sections on the islands of Lanai and Molokai. Besides spot-on reviews and updates, which always seem to steer us in the right direction, they are fun to read and offer many interesting tidbits to help plan your visit. Whenever a friend says that they are planning a trip, these are the books I recommend. They also make great gifts! 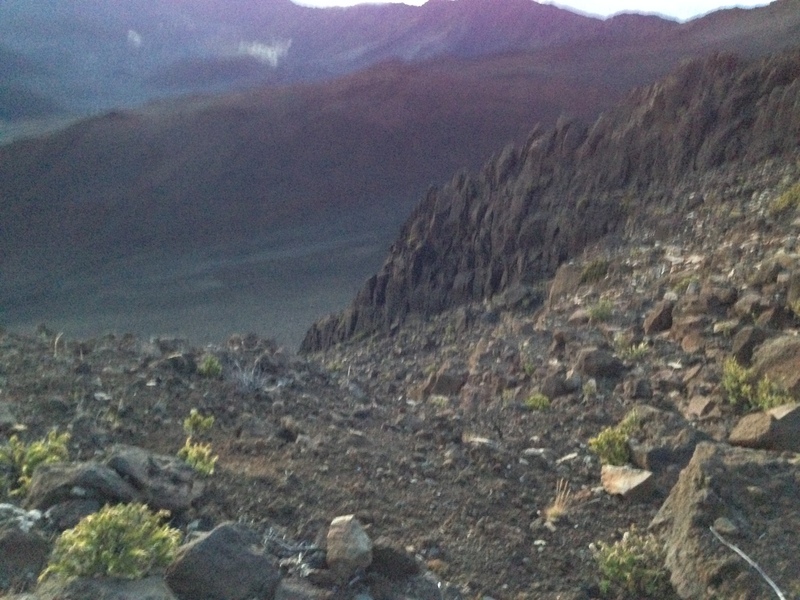 So, during a visit to Maui earlier this year, I read the section on Haleakala National Park with great interest. 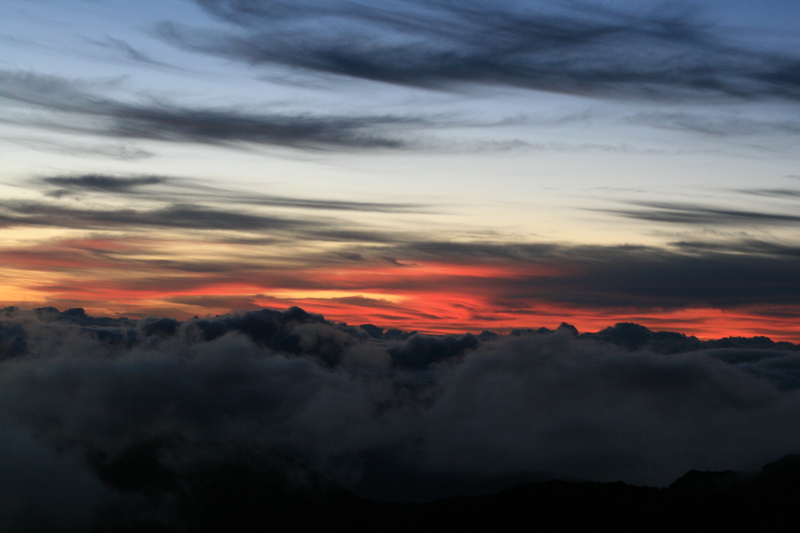 We had not witnessed sunrise from Haleakala (gasp!) and we really weren’t certain that it would be in our itinerary for this trip. Hiking, beaches, a trip to Lanai and relaxation were calling us instead. Still, we wanted to experience it for ourselves. And we decided that with realistic expectations we would have a great time and enjoy the journey. If nothing else, this would be a unique experience. We weren’t prepared for what we were about to experience. In a word: amazing. 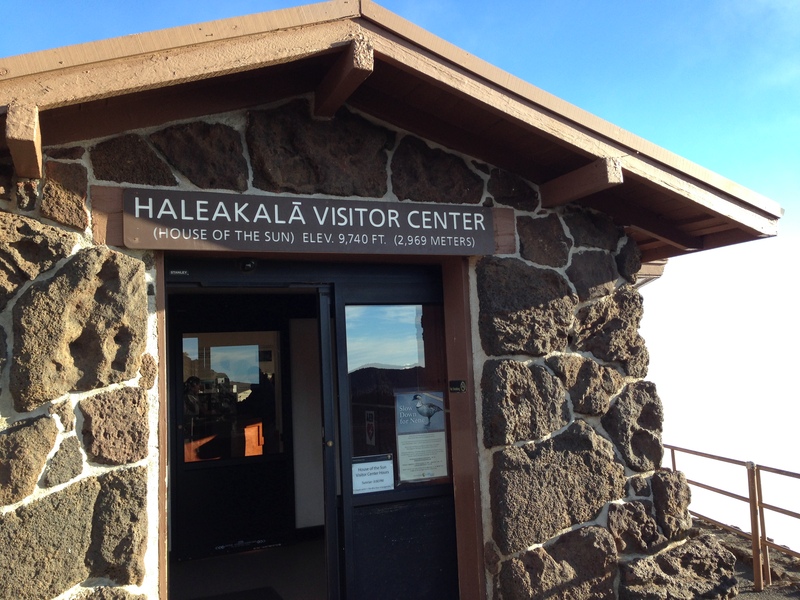 My husband and I were discussing our favorite experiences from 2013 and we both agreed that Haleakala was at the top of the list. A word of warning: It’s freezing up there. Now, we are from the Midwest where it’s a balmy and unusual 36 degrees here today, but tomorrow we are plunging into the deep freeze again with a predicted high of -1 and a low of -15. (Yes, a high of -1. Yet another reason I am obsessed with the islands of Hawaii.) 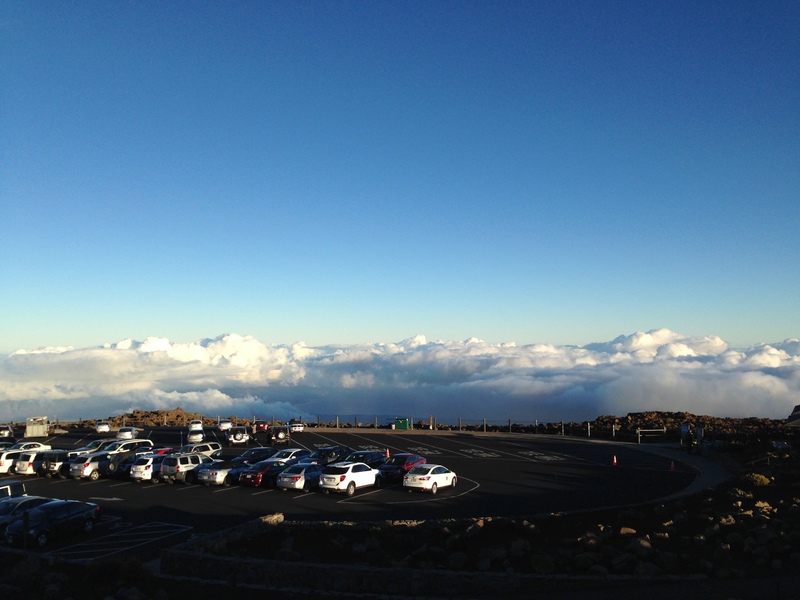 The cold at 10,023 feet in Hawaii is different. It’s damp, bone-chilling cold. Hard to describe, but still so worth it. And since my husband refused to pack mittens and hats for a trip to Maui, we improvised with lots of layers. The road, despite many twists and turns, is well maintained and fairly easy to navigate, even at 3 in the morning. 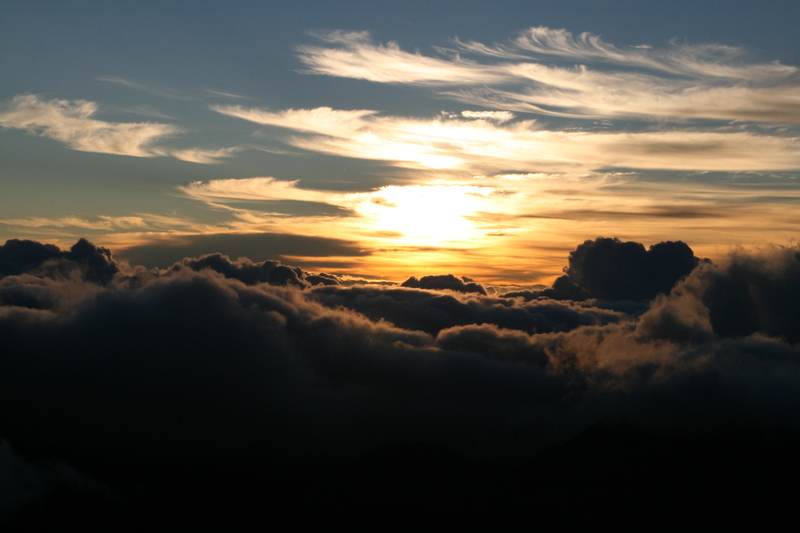 Another option is to visit Haleakala in late afternoon to watch sunset. Others told us that this is also an incredible experience if the weather and clouds cooperate. The view of dawn from above the clouds is indescribable. It gives new meaning to it’s always darkest before the dawn. It’s a miracle that the sun rises each day—and in our daily routines we don’t typically have the opportunity to pause and reflect on that. When a blanket of clouds formed just before the sunrise, we thought that perhaps we had picked a bad day to visit. They do happen. We met a couple right next to us who had made the trek just a day before and it was so cloudy that they couldn’t see anything through the fog. But on this morning the most glorious sunrise appeared out of the darkness. Dawn above the clouds is an experience one doesn’t forget. I could live off this memory for years. The drive back down is just as magical as you marvel and wonder at the world’s largest dormant volcanic crater and the majesty of the sea off in the distance. Take your time and hike to the summit. 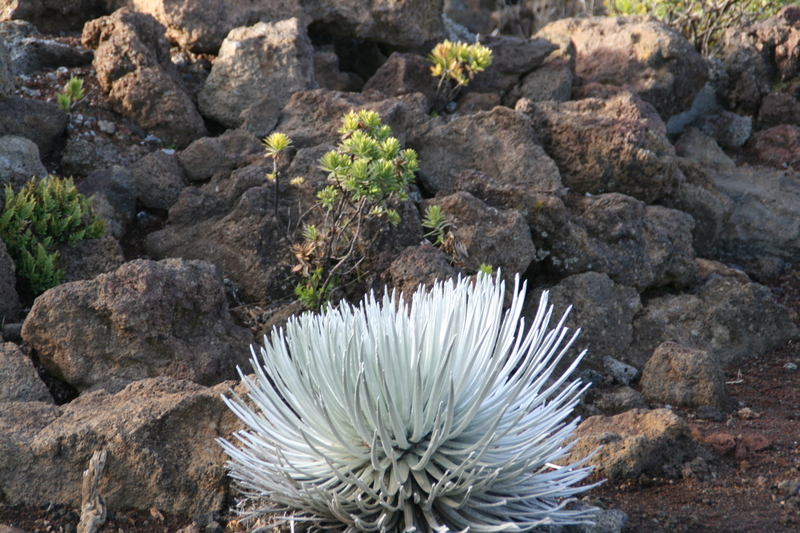 Enjoy the plants such as the silverwords that only grow here. 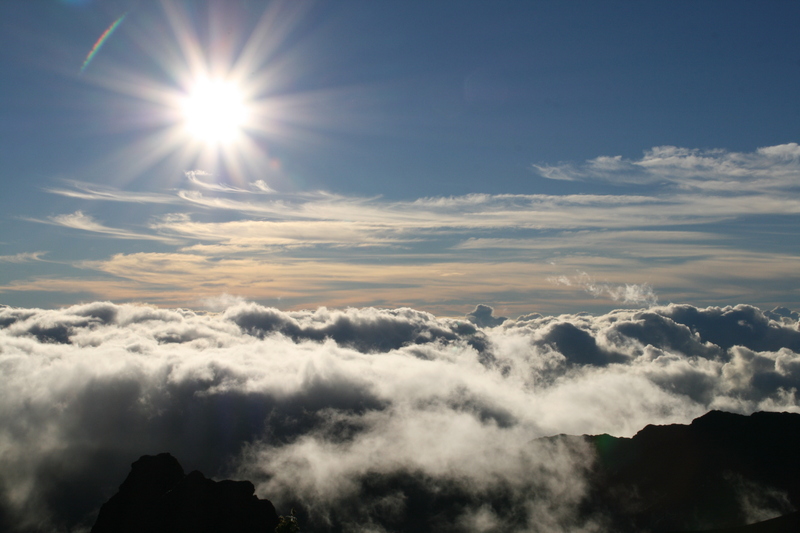 Haleakala means House of the Sun. There isn’t anything else like it on earth. 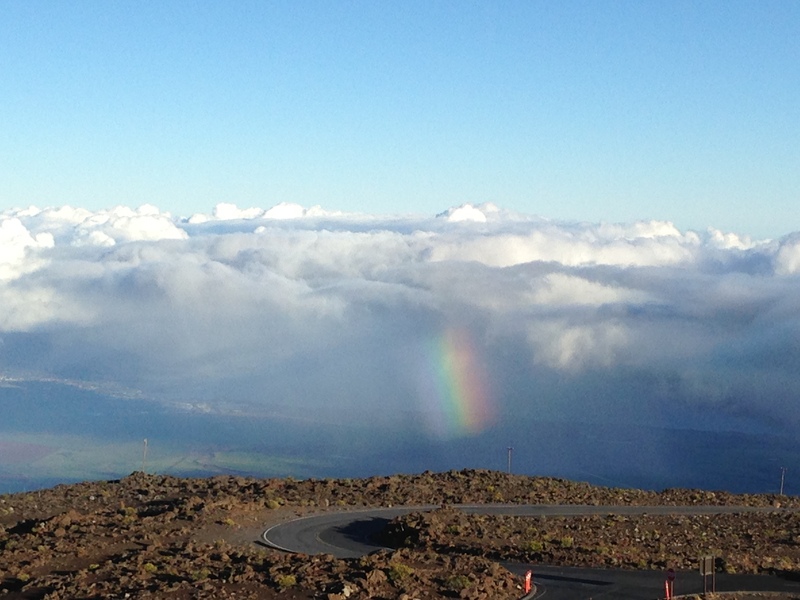 This entry was posted in Hawaii, Hawaiian Islands, Maui, Maui hikes, Travel, United States and tagged Haleakalā, Haleakalā National Park, Hawaii, Hawaiian Islands, Maui, National Parks, Travel, United States by alohajournal. Bookmark the permalink.